I am a teacher with certifications in Elementary (K-6), and English Second Language (ESL). I’ve always had a desire to help students who are struggling in reading, so in 2010, I earned a Masters in Reading (M.Ed.) and my Reading Specialist Certification. It was through one of my graduate classes that I had the opportunity to do a research project on dyslexia. This project really captured my interest, because I know, and have seen since then, students who struggle to learn to read and spell, and who don’t easily catch up, even when they receive special intervention. I became motivated to learn more about the Orton-Gillingham based approach that research shows is effective in helping students overcome the challenges of a Reading or Specific Learning Disability such as Dyslexia. In 2011, I received 120 hours of additional training and supervised experience in teaching using the Orton-Gillingham method via The Reading Center in Rochester, MN. This training, along with additional work, has given me the tools to provide the individualized, multi-sensory, structured, sequential and cumulative approach that is characteristic of Orton-Gillingham instruction. In July of 2013, I successfully completed the process and met the requirements to become a Certified Tutor in the Barton Reading & Spelling System. The Barton Reading and Spelling System is an Orton-Gillingham based approach that has been shown to be very effective with dyslexic students and others who struggle with reading and spelling. In June of 2014, I received training in LiPS (The Lindamood Phoneme Sequencing Program for Reading, Spelling and Speech). LiPS is an additional multi-sensory Orton-Gillingham based program. It is the only program recommended for students who cannot pass the initial Barton Screening and it also serves as an excellent alternative or additional tool for other students. In June of 2015, I completed the requirements during a full-day certification class led by Susan Barton, and I received my Advanced Certification in The Barton Reading & Spelling System. In 2015, I was also a Regional Winner in Comcast Business' Innovations 4 Entrepreneurs Contest. I used my award to enhance our online tutoring experience so that it is even more reliable, and also the most effective learning tool I can offer. In June of 2017, I completed a week-long, 40-hour training course in Orton-Gillingham Basic Reading offered through Ronald Yoshimoto's Orton-Gillingham International, Inc. NEW! 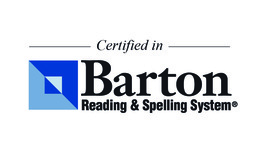 : On August 11th, 2018 I earned the Masters Level Certification for the Barton Reading & Spelling System. This is the highest level of certification for the Barton System and I am thrilled to be able to offer that level of experience and expertise in this excellent Orton-Gillingham based program. As a tutor, I wanted the ability to provide effective instruction to clients who fit the dyslexic profile. It’s not a requirement to have a formal diagnosis. I will informally screen each person who comes to me and let you know if you or your child are a good candidate for my specific approach. If not, I will make suggestions or referrals for other help. I can also make recommendations for further testing with professionals, if you wish to evaluate for a formal diagnosis of dyslexia or other issues. This will allow you to gain more information and, in some cases, to provide the school with information on accommodations (504 plan) or IEP goals and recommendations.